We live in an an age when devices, consoles and gadgets rule. Getting your kids away from those devices, limiting ‘screen time’, can be difficult for parents, and it impacts on time spent together as a family. With this in mind, Swim England have launched a new initiative – Love Swimming – that encourages families to swap screens for swimming trunks and swimsuits. Alongside nine partners, Swim England launched their campaign with a video called ‘Because Their Console Doesn’t Work Underwater’. All parents will be all too familiar with the constant battle with their kids and tablets and consoles. Once that battle is won, we need to find ways to positively engage our kids – and they almost always respond well to activities undertaken together as a family. Switch off and get moving – together! In a recent survey by OnePoll, almost nine in 10 people said gadgets get in the way of spending quality time together as a family, with families only spending an average of 36 minutes together on a weekday. Seven out of 10 parents even acknowledged there are times when they could be spending time with their children, but are busy playing on their phone or tablet instead – often both kids and parents alike. Ofcom’s 2017 Annual Report announced the internet has overtaken television as the top media pastime for British children, who are now spending 15 hours a week online, while the Children’s Commissioner is encouraging parents to give children time to switch off and get moving. Often the only time we get to spend time together as a family in a pool is on holiday, and a trip to the local swimming baths has become oddly unfashionable. Enjoying time together in the pool can genuinely help families reconnect, and kids invariably love it. To find your nearest pool and how to join the campaign, check out this pool finder, enter your postcode and love swimming! KUDOS encourages families from all backgrounds to go swimming together. 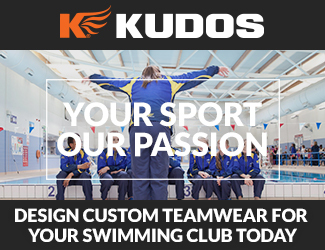 KUDOS custom swimming kits are designed to cope with the demands of the sport, in matching styles across all garments – including swimming team tracksuits, swimming kit, team hoodies and more.